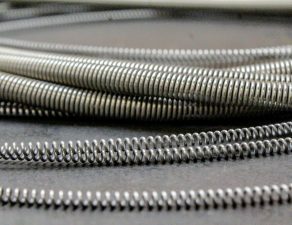 Garter Springs are a helical extension or compression spring which ends are connected to allow the spring to be held in a circle, the one end may be coned/looped. Their main applications are in oil seals, conveyor systems and motor drive belts. Connecting the ends can be accomplished in several ways such as; tapering one end and screwing into the opposite end, interlocking the end loops, soldering or using another short extension spring as a connector by screwing into both ends of the spring. Garter Springs are mainly used in Oil seals, of course they have many other uses such as; shaft seals, belt driven motors and electrical connectors. This is due to the fact that garter springs exert outward radial forces while extension garter springs exert inward radio forces.